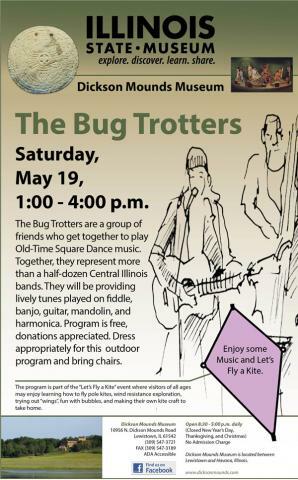 The Bug Trotters are a group of friends who get together to play Old-Time Square Dance music. Together, they represent more than a half-dozen Central Illinois bands. They will be providing lively tunes played on fiddle, banjo, guitar, mandolin, and harmonica. Program is free, donations appreciated. Dress appropriately for this outdoor program and bring chairs. This is part of the Family Day: Let's Fly a Kite event. Enjoy live music and kite flying.